The Neer do well Hall of Infamy blog is reporting that Émery Martin pleaded guilty to conspiracy to commit murder earlier in the week, right before the biker mega-trial was scheduled to begin at Montreal's Gouin courthouse. Martin, from Ste-Anne-de-Madawaska in New Brunswick, was arrested in 2009 during the SharQc sting operation. 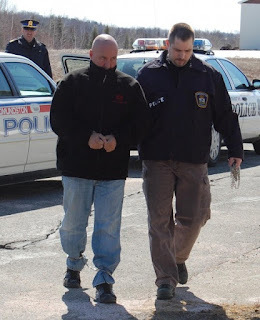 The Montreal Gazette is reporting that "Emery Martin, an alleged Hells Angels member who was accused of being part of a general murder conspiracy under the police operation dubbed SharQc, was sentenced to 15 years in prison Friday. Even so, Martin was given leave of his prison cell because he’s already spent the equivalent time in custody. Martin, who pleaded guilty last Monday, also had $30,000 confiscated." CBC is reporting that "Martin is one of 105 people who has pleaded guilty since 2009 to avoid a trial, while 31 others were released in 2011 after a judge ruled there had been unreasonable delays in their cases. Another three people have died since being charged, while eight others are still at large." Eighteen Hells Angels and associates pleaded guilty to taking part in a general conspiracy to commit murder March. In 2012 the court was told every murder was approved by a committee. So this guy gets sentenced and is instantly released because he's been in pre trial custody THAT LONG. Now we have exactly the same thing happening with the Jamie Bacon trial. Seven years after his arrest is the trial date now apparently. Justice needs to come by freight train (like the US) instead of mule train (Canada). "Toy runs"' and murder....hard to fathom. It's also hard to fathom a mere 15 years (which we know is drastically reduced for parole) for murder - it would be of the first degree as it was planned, orchestrated and carried out over years involving hundreds (those missing are not counted in the "150" or so death toll). It should be life in prison - not prison where you get to hang out with your buddies all day - but prison where punishment is balanced with rehabilitation (not one or the other garbage talk, but both combined). Not to mention prison uniforms and along with an uniform of clothing goes an uniform of appearance (hair, removal of tattoos if present, etc). If someone wants those, they can earn the privilege to have unique hair and dress and adornment through behaviour fitting for privileges.